A 44-year-old female patient presented to the ophthalmology outpatient service with decreased vision in the right eye for a period of 3 weeks associated with swelling in the region of the right eyelid and forehead. The patient had recurrent sinusitis, for which she was receiving antibiotic therapy. She also gave a history of recurrent headaches. On examination, there was right-sided proptosis, periorbital fullness and numbness in the right aspect of the forehead. The extra-ocular movements were restricted on the right side with right gaze being worse affected. Fundoscopy revealed disc edema. The neurological evaluation was unremarkable. Apart from screening blood tests, the patient underwent CT and MRI evaluation of the bilateral orbits. The CT showed a well-delineated, enhancing, postseptal mass measuring approximately 2.9 cm x 1.2 cm in the right orbit along the right lateral rectus and superior rectus muscles. The mass was extending into the right cavernous sinus through the superior orbital fissure and into the sella, displacing the pituitary gland. There was medial displacement of the optic nerve (Figure 1). On MRI, the mass showed intense enhancement and involved the right lateral rectus, superior rectus and the right lacrimal gland. A soft-tissue enhancing mass extended into the optic canal, causing compression and medial displacement of the right optic nerve (Figure 2A). There was involvement of the right cavernous sinus with extension into the right aspect of the sella, causing contralateral displacement of the pituitary gland and the infundibulum. There was smooth enhancement of dura along the sphenoid wing, right tentorial incisura and clivus (Figure 2B). Biopsy was performed via a lateral orbitotomy approach. The histological features were consistent with idiopathic sclerosing orbital inflammation with foci of vasculitis and chronic inflammation and fibrosis of adipose tissue and skeletal muscle. All the laboratory culture reports were negative. ESR, CRP, and autoimmune screening were normal. Inflammatory workup, including ACE, Lysozyme, ANA, C-ANCA and RF, were all negative. The chest X-ray was also normal. The patient was started on 60 mg prednisone per day. The patient showed drastic improvement in vision, extraocular movements and proptosis on follow-up visits. On correlating imaging features, histopathological findings, laboratory workup and response to steroid therapy, the diagnosis was finalized. Orbital pseudotumor with cavernous sinus and sellar extension. Differential diagnostic considerations included neoplastic processes such as orbital lymphoma with intracranial extension or sphenoid wing meningioma with intraorbital extension. Idiopathic orbital inflammation is a nongranulomatous inflammatory process in the orbit without any underlying local or systemic causes.1,2 This was first described as pseudotumor in by Birch-Hirschfield (1905).3 The diagnosis is based on history, laboratory tests, clinical course, response to steroid therapy and histopathological analysis. The diagnostic work up aims at exclusion of other systemic and inflammatory processes that can involve the orbit such as Graves’ disease, lymphoma, sarcoidosis, Wegener’s granulomatosis, infection (bacterial, fungal, parasitic), vasculitis, and amyloidosis.3 In the clinical setting of persistent, progressive, or recurrent orbital disease, biopsy should be performed to rule out orbital pseudotumor. Orbital pseudotumor may involve extraocular muscles, fat, sclera, optic nerve, or lacrimal gland. Extraorbital extension occurs in 8.9% of cases (Clifton et al., 1992).1 Several authors have described extraorbital extension of pseudotumor with involvement of paranasal sinuses, anterior and middle cranial fossa and infratemporal region. The intracranial extension has been described through the three major openings in the posterior aspect of the orbit, which include the superior orbital fissure, optic canal and the inferior orbital fissure.4 The common locations of intracranial extension have been described as the middle cranial fossa and cavernous sinus. Similar findings were observed in our patient. Intrasellar extension with displacement of the pituitary gland as seen in our case has not been previously described.5 However, no hormonal abnormalities secondary to pituitary gland compression were noted. The symptoms of idiopathic pseudotumors reflect the stage and extension of the inflammatory response. Acute, subacute on chronic forms of inflammatory pseudotumors have been described. The chronic sclerosing form extends over a period of months and has symptoms of fixation of orbital structures with mass effect.6 A pseudotumor in acute form is more responsive to high doses of systemically administered prednisone than a chronic lesion. There is complete resolution of the inflammation on treatment, although a recurrence may occur in the same or other orbit. In previously described cases with intracranial extension, multiple intracranial nerve palsies were observed.7 Transient ischemic attack secondary to involvement of the internal carotid arteries has also been described.4 However, in our case study, no symptoms pertaining to intracranial extension were observed. The radiological evaluation of pseudotumor generally consists of CT and MRI evaluation. No definite characteristics of the orbital soft tissue mass suggestive of pseudotumor are identified on the CT scanning. 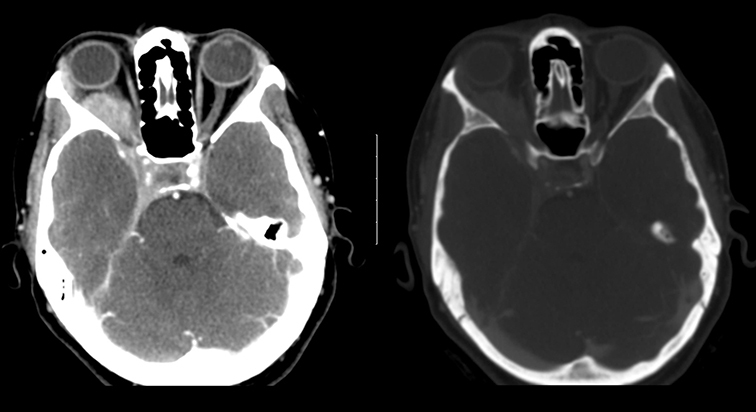 However, extra orbital extension and bony erosions could be well evaluated by CT. Bony changes secondary to pseudotumor may be reflected as hyperostosis or bone destruction.8 MRI shows presence of hypointense lesion on both T1 and T2-weighted images secondary to predominant fibrotic component of the soft tissue tumor. Marked postcontrast enhancement has been described.9 Similar features were observed in our case. An orbital pseudotumor can have extraorbital extension resulting in widespread clinical symptoms. In the setting of an orbital mass with intracranial extension, the possibility of pseudotumor should be considered by the reading radiologist. This would not only help the treating physician in the choice of appropriate therapy but also eliminate the need for unwarranted biopsy or surgery. Mahr MA, Salomao DR, Garrity JA. Inflammatory orbital pseudotumor with extension beyond the orbit. Am J Ophthalmol. 2004 Sep;138(3):396-400. Soares D, Crandon I, Char G, Webster D, Carpenter R. Orbital psuedotumour with intracranial extension. A case report. West Indian Med J. 1998;47(2):68-71. De Jesús O, Inserni JA, Gonzalez A, Colón LE. Idiopathic orbital inflammation with intracranial extension. Case report. J Neurosurg. 1996;85(3):510-513. Borruat FX, Vuilleumier P, Ducrey N, Fankhauser H, Janzer RC, Regli F. Idiopathic orbital inflammation (orbital inflammatory pseudotumour): An unusual cause of transient ischaemic attack. J Neurol Neurosurg Psychiatry. 1995; 58(1):88-90. Olmos PR, Falko JM, Rea GL, Boesel CP, Chakeres DW, McGhee DB. Fibrosing pseudotumor of the sella and parasellar area producing hypopituitarism and multiple cranial nerve palsies. Neurosurgery. 1993;32(6):1015-1021. Bencherif B, Zouaoui A, Chedid G, Kujas M, Van Effenterre R, Marsault C. Intracranial extension of an idiopathic orbital inflammatory pseudotumor. AJNR Am J Neuroradiol. 1993;14(1):181-184. Tay E, Gibson A, Chaudhary N, Olver J. Idiopathic orbital inflammation with extensive intra- and extracranial extension presenting as 6th nerve palsy—a case report and literature review. Orbit. 2008;27(6):458-461. Clifton AG, Borgstein RL, Moseley IF, Kendall BE, Shaw PJ. Intracranial extension of orbital pseudotumour. Clin Radiol. 1992;45(1):23-26. Dorfman RE, Spickler EM. Current status of magnetic resonance imaging of the orbit. Top Magn Reson Imaging. 1990;2(4):17-26. 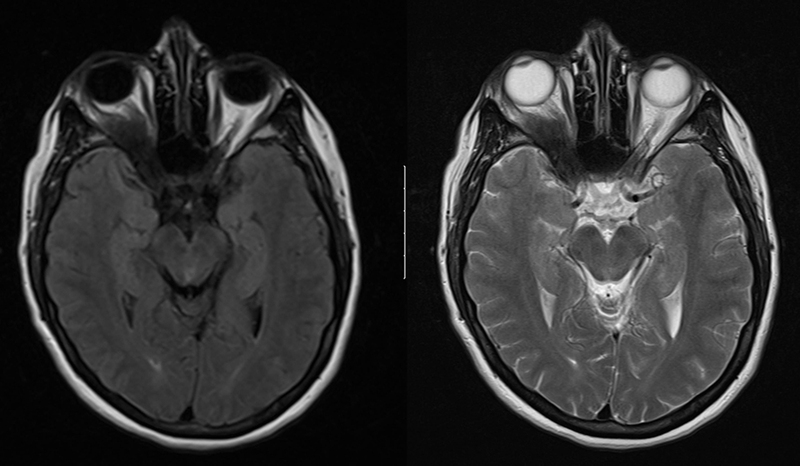 Radiological Case: Orbital pseudotumor with cavernous sinus and sellar extension. Appl Radiol.